"Fresh... fascinating... Graeber’s book is not just thought-provoking, but also exceedingly timely." "An amazing debut – conversational, pugnacious, propulsive"
I was really disappointed in this book. It came recommended from a friend and I was hoping for some new ideas or insights around money and economics. It really is just a nonsensical ramble of which I was not able to eke out much. This review is the least I can do to warn others to not repeat my money and time waste. The author spends a lot of time at the beginning critiquing the "myth" of barter (that two paragraph parable at the beginning of 8th grade economics manuals - of how people would try to barter and thus discover it would be easier to use money). He builds this two paragraph parable into a huge straw-man, calling it the "founding myth of economics" which he proceeds to attack. That's his attempt to take down the discipline of economics (pls. note I am not calling it a science). That's like taking down anatomy because the anatomy drawings in the 6th grade manual are not accurate. The barter parable is meant to illustrate that any transactions (barter, credit, taxes etc) are nearly impossible without a universal unit of measure for value exchanged. Which is money. The parable uses the example of barter for a transaction because it is much easier for 8th graders to imagine that rather than more complicated transactions such as credit and taxes. He argues that anthropologists found no societies without money in which significant volumes of barter exists. Of course they did not. Without money it is impossible to keep track of the price of everything against everything. Which is the point the barter parable is trying to make in a simplistic way. Next the author argues that money is tied to credit transactions (including taxes) and that credit and money are really like the chicken and the egg. Of course they are. Credit transactions are exchanges of value with a time lag. Without a way to quantify the value exchanged they are nearly impossible to make (just like barter). And of course money is not coins. Coins are just symbols for money just like bank notes. The radical idea found by the author is that exchanges of value (trading goods, trading value in time as in credit, paying taxes) are impossible without a way to measure that value. Which btw. is exactly what the economists' parable of barter is trying to say too. All of this is peppered with random anthropological accounts, quotes from Nietzsche, quotes from some french economists about our primordial debt to gods, cries that our lives have become a "series of commercial transactions", and nonsensical expressions such as "bourgeois assumptions" (really? bourgeois?). The intent is to argue that money was involved in almost everything bad people did to each other through history and therefore there's something mysterious and bad about money (debt = money = slavery = capitalism = bad, or something like that). But wooden sticks, metals, clothes, and pretty much everything else including language were also involved in pretty much everything bad some people did to some other. So why single out money? Because it is an abstract concept, and abstract and invisible things draw weak minds like candles draw moths. Ever wonder why loonies come up with perpetual motion machines involving electricity and magnetism a lot more often than involving mechanics or thermodynamics? For the same reason - electricity and magnetism, just like money, are invisible and mysterious. Easier to make up fantasies about. Graeber's book is a long, slow read, yet it is a fascinating page-turner for which I enjoyed EVERY SINGLE PAGE. I would highly recommend this five-star book to anyone who enjoys investigating the mysteries of economics in our modern world and to anyone who enjoys history, sociology, anthropology, or looking for major historical trends which tie together and explain world events. I saw a few critical reviews while reading this book, and now that I have finished, my opinion is that anyone who negatively reviews this book only read a portion of it. Most of the critical reviews are dismissive of his "point-of-view" as being "wrong." However, anyone who has actually read the whole book realizes that he has stepped back and looked at these issues from multiple perspectives and through the lens of multiple disciplines. People who are upset by this book (or by the introductory chapters) are upset because today's economics teaching focuses only on a small piece of the "economics thought pie" (my term) which is out there. Graeber steps out into discussing pieces which are less covered (or not covered at all) in typical economics classes in the West of today. 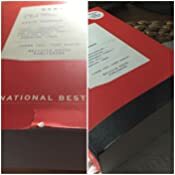 So, rather than reading through his arguments, and seeing where they wind up by reading the whole book, I am certain these people gave up only part-way into the book, and then wrote a negative review because the ideas are different (much wider and more complicated) than they have been taught, and they find it "out of their paradigm" and just can't accept reading further. Yet, anyone should be able to read alternative ideas that challenge traditional ideas in order to see if their beliefs really stand up under scrutiny. So much information is packed into Debt: The First 5,000 Years, that it could easily have been written as five separate stand-alone books. 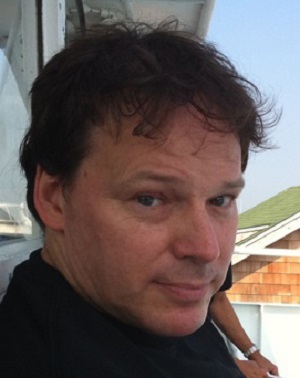 As an anthropologist at the London School of Economics, Graeber wrote a massive, sprawling history of debt, credit, and the development of markets and money; he ties it to war, slavery, taxes, tribute, government bureaucracy, religious thought, and both local and international trade, by looking at societies from ancient Mesopotamia, to India, to China, to ancient Greece and Rome, to Latin America, to the Middle Ages, and to the Modern Ages. Why did he do it this way? Several reasons. First, as an anthropologist, he felt he was in a unique position to help us completely rethink our sense of the rhythms of economic history. Economists and historians, he points out, normally come at history in opposite directions. "Economists tend to come at history with their mathematical models--and the assumptions about human nature that come along with them--already in place: it's largely a matter of arranging the data around equations. Historians .....often refuse to extrapolate at all; in the absence of direct evidence.....they will not ask whether it is reasonable to make (certain) assumptions....this is why we have so many "histories of money" that are actually histories of coinage....Anthropologists, in contrast, are empirical--they don't just apply preset models--but they also have such a wealth of comparative material at their disposal they CAN actually speculate about what village assemblies in Bronze Age Europe or credit systems in ancient China were likely to be like. And they can reexamine the evidence to see if it confirms or contradicts their assessment." Second, as a admirer of French anthropologist Marcel Mauss, by writing this book, Graeber feels he has put to rest the real "pet peeve" of anthropologists everywhere--the myth of barter. I found this a shocking idea when introduced to it at the beginning of the book, but he has really convinced me as a reader through his extensive and comprehensive looks at every possible facet of this question. I will try to summarize in one paragraph the large sweeping ideas covered in this book. What is money, really? What determines what gets used as money, and why? Certain historical ages operated on mutual credit systems, with practically no coinage at all in circulations (for hundreds or even thousands of years at a time); other ages operated with coin made out of various precious metals. What were the differences between the types of ages when these different types of systems occurred in societies around-the-world, and what were the causes of these differences? Historically, when did these various ages occur, and why? What is happening now, and is the current situation in the world changing? We seem to have recently entered a new age of credit, but in many ways, completely unlike past ages of credit, with historical trends now completely reversed between creditors and debtors compared to past credit ages. How does war and slavery factor into all of this? What is capitalism and how did it come about? Does it really work as it claims to? What are the problems and myths associated with capitalism? What does faith and credit in government and society mean, and what has it meant throughout all historical ages around-the-world? These are just a few of the book's largest questions. Now I will touch on what this book meant to me personally. As an American living overseas in North Africa, I really enjoyed his discussion of how credit was handled during the Middle Ages in Europe, with most people living on credit in regards to each other. It reminded me of the system we even continue to use in North Africa, even in cities, with the merchants at the corner stores (which are our societal equivalents of 7-11 stores). Each family has a notebook which they bring with them to the store each time they want to purchase something. The merchant notes it in the book, and accounts are settled up at the end of the month. Without cash or coin available to most of the populace in the European Middle Ages, everyone operated on such bases with their neighbors, everyone kept accounts, and accounts were settled up in the whole village once or twice a year, usually at specific times or festivals. I found this really interesting. Many such examples from the book meant something to me in my own life, but they would be too numerous to list here. The price of this paperback was one for which I got more than my money's worth, many times over, for the many pleasurable hours of reading, and all I learned, in a highly-enjoyable and extremely well-written text. I wish I could sit in on David Graeber's class. Be prepared--you will want to discuss this book with friends, so try to get a friend or a book club group to read it with you. Reading this book has given me an understanding of world history at a level I have never reached before. I highly recommend it for anyone interested in world history. At the same as reading this book, I was also reading books by Fools Crow, Crow Dog and Bear Heart. 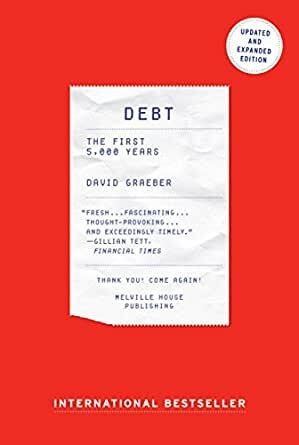 Each of these authors describe how the Federal Government set out to use debt to subjugate and eradicate Native Americans just as described in Graeber's book.